You have reached BW Mining, specialists in data mining and mineral exploration. We provide a unique consulting service to the mineral industry using modern data mining techniques to integrate multidisciplinary exploration data sets, such as geology, structure, geophysics, geochemistry and remote sensing. We have developed a new multivariate statistical process that is completely objective and takes account of all the available data in a given area. The output is a sharply focused target map for follow-up exploration. Our resources are best aimed at exploration teams, districts and projects that are most likely to be successful and yield producing mines. BWM is flexible, but our preferred business plan is to provide our services at low entry cost, with true rewards coming only with our clients’ success. 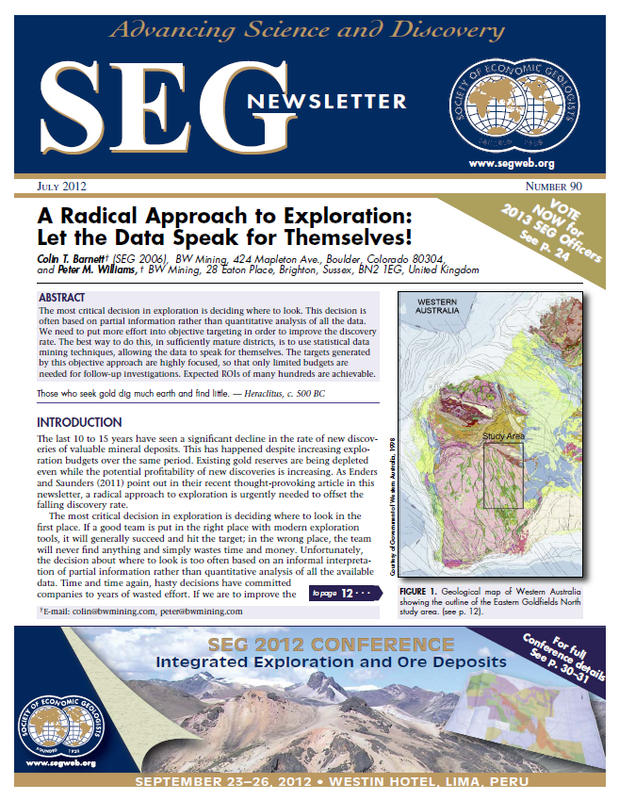 A paper by Colin Barnett and Peter Williams is selected as the featured article of the July 2012 issue of the SEG Newsletter. Download here.